To use debugging, the constant WP_DEBUG needs to be set to true. Twig includes a dump function that can output the properties of an object. For a highlighted output like you see it above, you need to have xDebug enabled in your local development environment. With some environments like MAMP, enabling it is as easy as ticking a checkbox and restarting the server. Other times, it might be more complex. <!-- / End output of "partials/navigation.twig" -->). The extension is only active when WP_DEBUG is set to true. Certain IDEs allow you to set breakpoints in your PHP code. To do that in Twig, you can use the AjglBreakpointTwigExtension extension, that allows you to set breakpoints and inspect environment and context variables. The Timber Debugger package includes all three extensions mentioned above: the Timber Dump extension, the Timber Commented Include extension and the Twig Breakpoints extension. 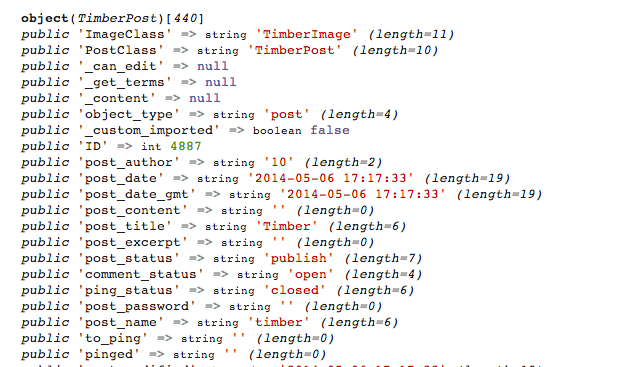 There’s a Timber add-on for the WordPress debug bar. Warning: this currently requires PHP 5.4. You can also use some quick filters on an object. These are legacy and will be removed in favor of using Twig’s built-in functionality. However, these do not require that WP_DEBUG be turned on. Passes the variable to PHP’s print_r function. This filter answers the question: What type of object am I working with? It passes a variable to PHP’s get_class function. 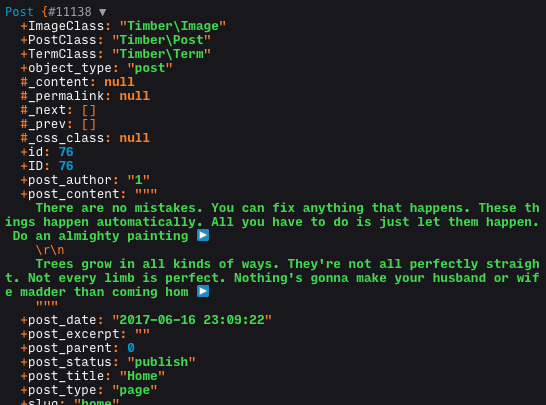 It will output something like TimberPost or your custom wrapper object.